“Here let me get that” said the helpful bus driver as I picked up my full rucksack and prepared to get off the bus approx. 2 miles west of the Cluanie Inn. 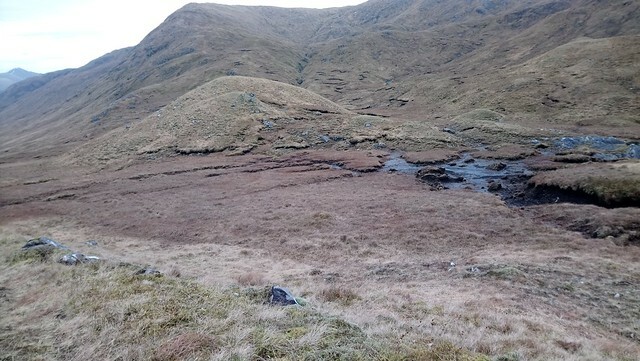 It was just after 3 pm on a wet and windy February Saturday and the driver asked me what I was doing (there being no houses or signs of habitation nearby) I told him that I was off to walk over the hills along the Watershed to near Achnasheen, I hoped it would take five days. “Camping?...On your own?... I’m not sure he would have treated a man in the same way but his concern touched me and I almost suggested that he abandon his busload of passengers bound for Skye and Uig and carry my rucksack for me over the hills, but he was woefully unprepared for Scotland outdoors in February. I reassured him that had I had walked (in stages) all the way from the Borders and was used to it. As I waved the bus goodbye, I had visions of him listening for news reports of missing female walkers of a certain age. The rain that had lashed the bus since Inverness had stopped as I made my way over the small stock fence and started up the steep hillside heading for the Meall a’ Charra ridge and hopefully, a flat sheltered spot to camp for the night. Those of you who have followed my journey so far will have spotted a few things. Firstly, I have not placed this report in the Long Distance Routes forum, where all my other reports on this walk are. I will eventually incorporate it into a longer report and put it there. 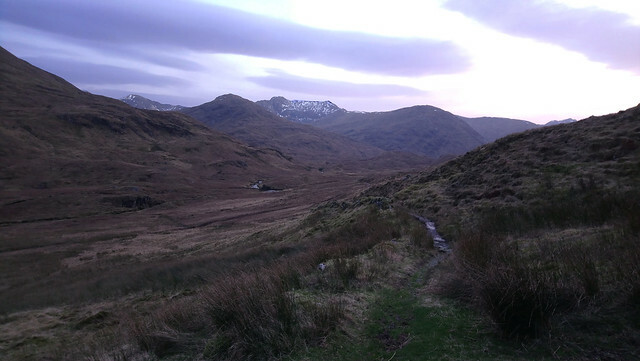 Secondly, I missed off the last ½ mile of the true Watershed as I came down to the A 87 from the S. Cluanie ridge on my last trip in November. I intended to go back and do it at the start of this outing but looking at it and my actual route down, I hadn’t been that far off and with more daylight available I probably would have gone back over it but for now I wanted to get ahead on the next section. Thirdly, I never expected to be walking the ’Shed in February. 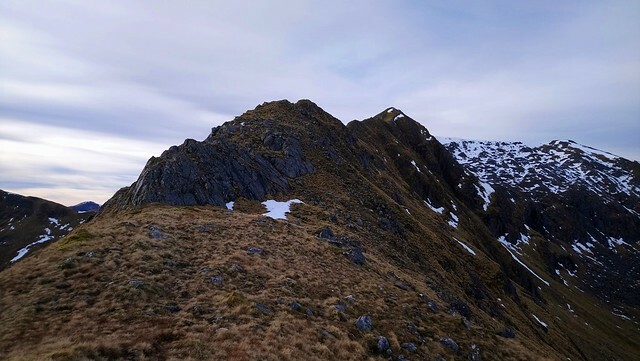 5 days of walking one of the remoter sections of the ‘Shed carrying all the gear necessary for dealing with snow and ice and shorter day length had not been in my plans. 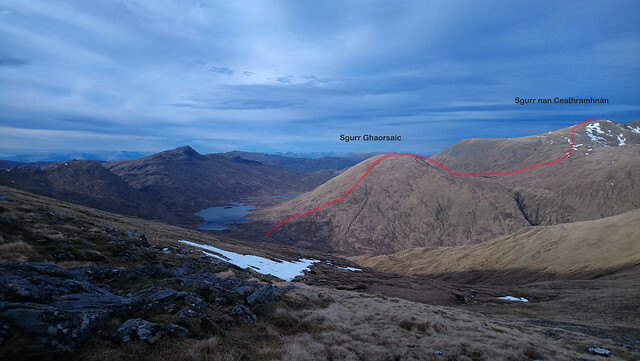 The section ahead went over the highest hill on the whole Watershed, Sgurr nan Ceathreamhnan and, after the first day, escape routes were minimal. I had sympathy with the bus driver who clearly thought I was mad and I was quite concerned as to what was up ahead. So why was I here? Listening to the Good Morning Scotland on Thursday 21st Feb there was a report on the lack of snow at all the Scottish Ski Centres plus a forecast for unseasonably mild weather for the week ahead. Checking the MWIS I realised that I had an opportunity to complete the next section. Initially I planned to set off from home on Friday but had to put this back a day which was no bad thing as Saturday turned out to be windy and wet. 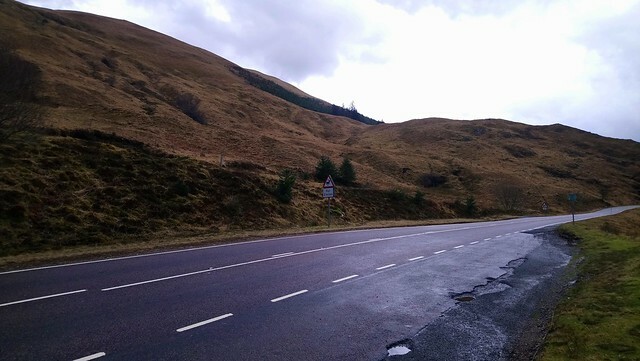 I had been sitting on various buses for 8 hours (with a couple of short breaks at Aberdeen and Inverness) so I took the steep slope slowly but as ever in such terrain gained height relatively quickly. The wind came in strong blasts but the rain was off so I was singing "I can see cleary now the rain has gone" and once I made the ridge I spent some time looking for a sheltered site to pitch. There were plenty of flat but very wet spots and I eventually found a dampish spot that had a lovely view down to Loch Cluanie. I was going to have no view of the sunset (low cloud meant that I wasn’t missing anything) but hopefully I would have a fine sunrise. Although sheltered, one or two blasts of wind found me and occasionally gusts woke me during the night setting the flysheet thrumming. Given the early nightfall, I was asleep early but woke with what I thought was the moon shining on the tent. It was moving very quickly and followed by another. UFOs?, no this weird effect turned out to be cars travelling west on the A87. They were at the end of Loch Cluanie 400 m below me and over 2 miles away. No need for an alarm I woke to a red sky in the east and ice on the tent. As the sun rose it turned the mountains golden and any shepherds could heed the warning and stay at home but it looked good enough for me. I was soon picking out the hills around me and pinching myself that it was actually February as there was warmth in the sun. Musical accompaniment; "Lovely Day". 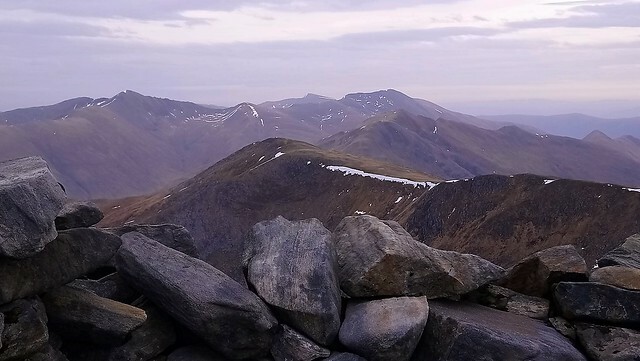 The gradient was gentle to the top of Meall a Charra then steepening to Sgurr a’ Bhealaich Dearg and its narrow ridge to the summit cairn. 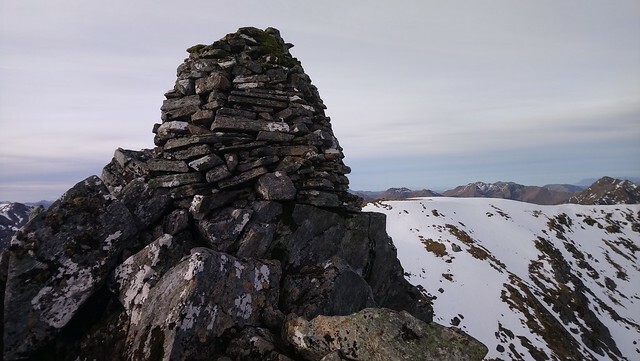 This is one of the most memorable Munro summits, with a fine dry stane dyke atop the ridge and a well-built cairn as a full stop at the end. No-one else was about which was good as there isn’t much room for more than a few folks at the summit. I eased myself around the cairn and looked at the route ahead. 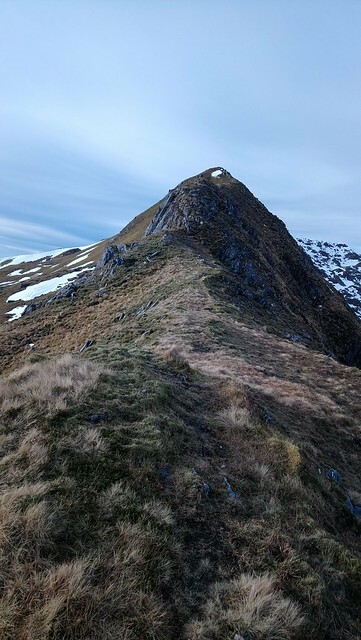 Most people looking for a tick would approach this hill either from Saileag to the west (as I had done in both my previous ascents of this hill) or from Aonach Meadhain to the east. Not so the Watershed. It often approaches hills the hard, cross-grained way and the first part of this outing was no exception. 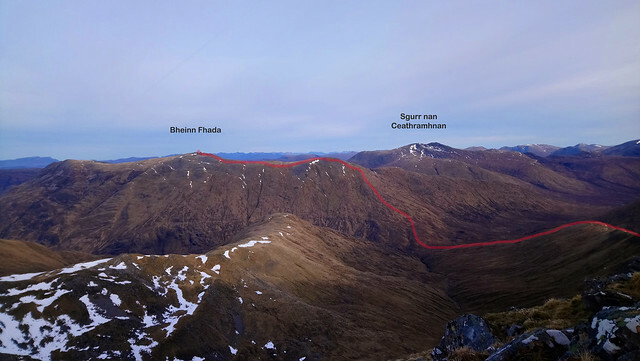 My route ahead involved a near 700 m descent down Streath a Ghlas-Choirethe to the head of Gleann Lichd before a 600m ascent to Sgurr a’Dubh Doire, the easterly Munro top on Beinn Fhada. I felt a bit daunted by the ridge ahead. It looked narrow and scrambly, the sort of ridge that gives me plenty of enjoyment if I am in company but on my own my bottle goes and I wibble and wobble, dither and dawdle. There were patches of hard snow that hadn't succumbed to the mild daytime temperatures but none that could not be avoided. Higher up it is relatively easy, with flat sections and no real issues but I kept looking at the bumpy bits ahead and thinking they looked steep and exposed. 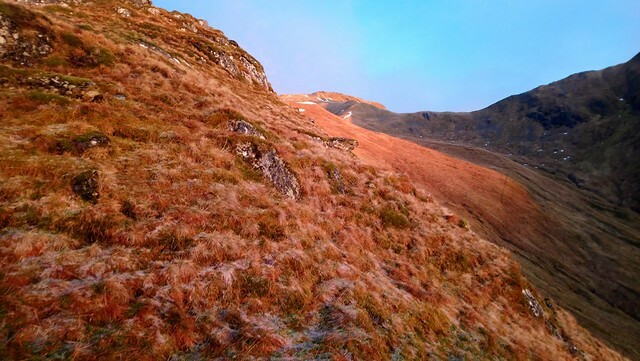 In fact, the hardest bit was a steep grassy section where the grass still retained its slippery frozen state from the cold night. After this I could see a possible escape route off to the left but my feet took me to the crest of the ridge and it presented no real difficulty with good flat foot holds and plenty of hand holds if needed. It had one or two slightly airy places but after a cautious start I began to relax and enjoy it. I also realised that in the accounts I had read of the Watershed this ridge is not remarked on so I stopped whimpering and got in with it singing "Nothing's gonna stop me now". At about 500 metres I was surprised to pick up a strong gusty wind but it disappeared again before the glen where I enjoyed a late lunch. All the way down I had seen the red roof of Camban bothy. It looked reassuring and welcoming, just a short way off the Watershed. I wasn’t intending to stop there but it was good to know that it was a possible refuge if needed. Above me I could see patches of snow overlapping the edge of the crest to Sgurr a’Dubh Doire but hoped that these could be by-passed. I hadn’t come far but the next pull up seemed to take my energy although I was distracted by the sight of an eagle, too far away to identify which flavour but distinctly eagle in behaviour. Again at 500m the wind found me only this time it didn’t let me alone, pushing roughly against me so much so I started to contour around the hill as I climbed, hoping to find refuge from it. 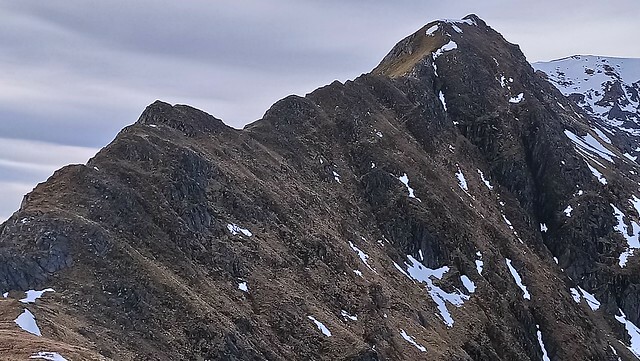 When I made the crest line below Sgurr a Doire Dubh ("Zip-a-dee-do-dah, Zip-a-dee-day"), the wind still hadn’t let up and I began to seriously doubt whether I could manage to walk across to the summit of Beinn Fhada and down to the shores of Loch a'Bhealaich where I intended to camp for the night. I still had 3 ½ hours of good daylight but was concerned that if there were tricky snow patches on the descent from the summit trig point, that I would get “trapped” without anywhere to camp out of the now ferocious wind. I knew that the wind had a habit of playing tricks and the summit plateau maybe relatively calm but as I could barely stand where I was and with 100 m of a steep climb into the wind I did what I do best, I played safe. I succumbed to the lure of Camban and the prospect of a wind-free night. I suspect that this was a decision that I had made when I had first seen the bothy. 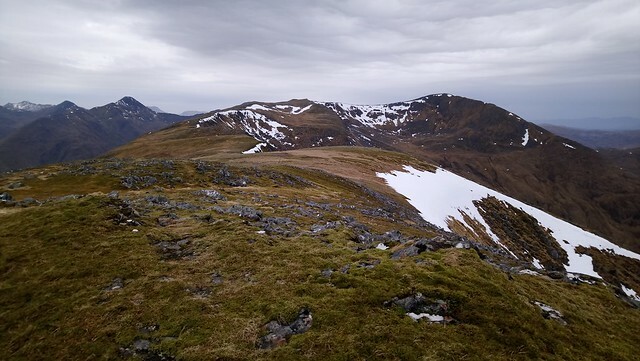 I fair bowled along the ridge to the east once my mind was made up but also noted that there looked to be a fair amount of snow on that NE ridge descent to Loch a Bhealaich. 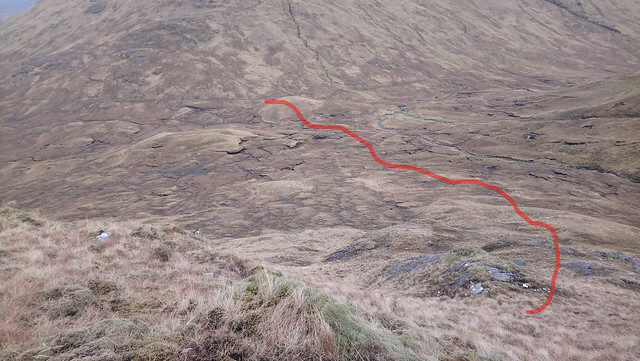 Peter Wright mentions careful route finding is required and given that he had made no mention of this on my first descent of the day, I felt my decision of bothy retreat was sensible rather than cowardly ( I am also very good at justifying retreats!) I had good views down to Loch Affric beyond the youth hostel as I descended. 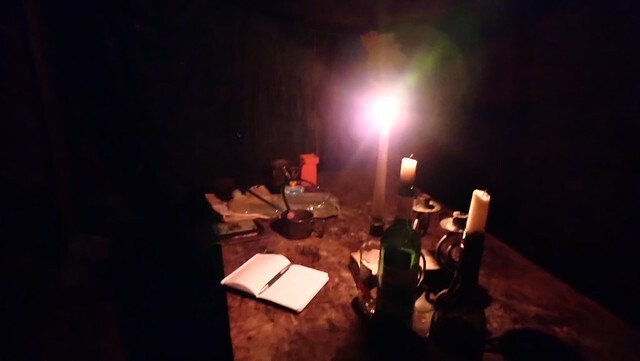 "Non, Je ne Regret Rien"
The bothy was clean and rubbish–free and I had it to myself apart from the many folks who had passed through and written in the bothy book. 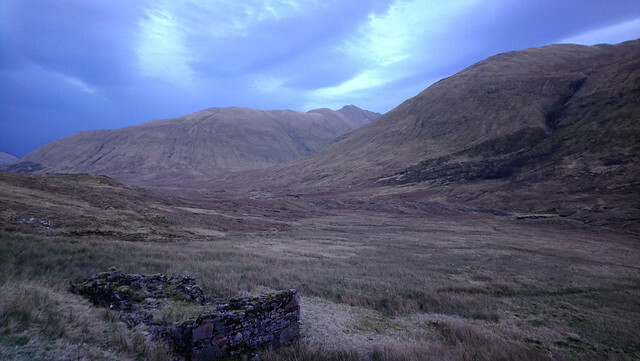 I felt their presence and during the long dark evening enjoyed reading about their journeys to and from the bothy. The accounts of the Watershed that I have read by Dave Hewitt, Peter Wright and Chris Townsend all include stops at Camban so I felt that I was following a Watershed tradition. I also decided that next day I would tackle Ben Fhada, a la Dave Hewitt, fast (well everything is relative) and light. I would leave my tent drying (although I had brushed the ice off there had still been enough moisture to get it wet). Another early night and I didn’t bother setting the alarm. At some stage I had a vivid dream, falling backwards off a ridge due to the excessive weight off my pack. I woke suddenly my heart thumping but surprisingly I managed to fall asleep fairly quickly, sleeping late without even noticing if there were mice about. When I woke I was in no hurry to move, conscious that I had the whole day but also that if conditions were good I could move on from the bothy later. The day went exceptionally well. Not as fine as the previous day but without a heavy pack even the stile didn’t present much of an obstacle. A ptarmigan in winter plumage was easily spotted against the brown of the snow free vegetation. 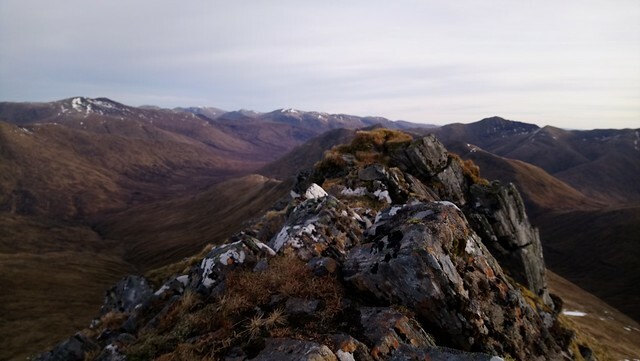 As the cairn of Sgurr a’Dubh Doire came into view just 20 metres from the last bluff a movement caught my attention and an eagle took off and soared above me. My heart soared along with it. It is one of the closest encounters I have had with these magnificent birds and I reflected that I have seen them on most trips to the Watershed since crossing the Great Glen. 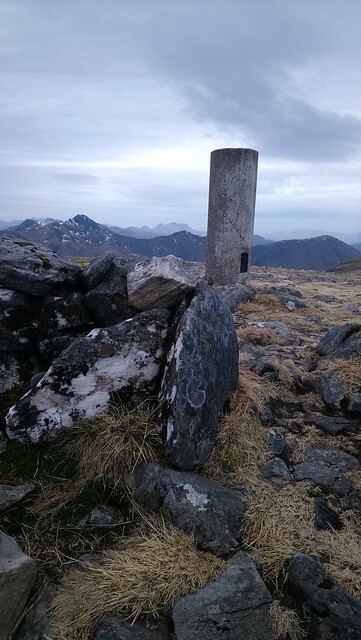 "You lift me up where we belong"
There was a stiff breeze but although heading almost into it for the first half of the walk across to Beinn Fhada’s summit and trig point it did not impede my progress and I reached the summit in just under an hour. Despite the poorer visibility today, I was able to pick out The Ben and also Sgurr na Ciche with all the hills in between. At the summit, I checked the MWIS website, always important but especially so at this time of year. I was not impressed to see that the next day low cloud was going to come in and cover the hills down to 600-800m. This is not how I wanted to cross Sgurr nan Ceathramhnan, the highest hill on the Watershed. 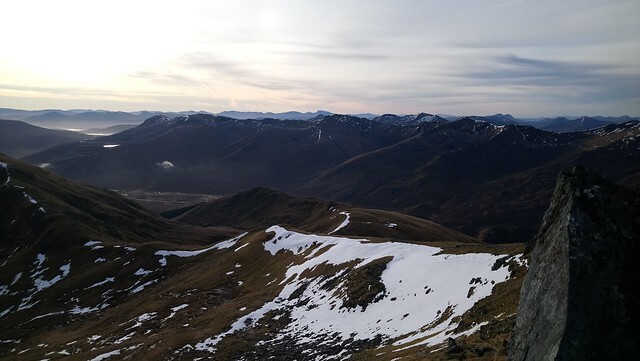 I texted my daughter to advise that I had changed my plans and would spend a 2nd night at the bothy and walk to Glen Shiel on Tuesday. I would then see what the weather was like and maybe stay on and do some more walking in the area. I had plenty of supplies after all. I did think about maybe heading over SnC on Wednesday but by then I wouldn’t have enough supplies to get me to the A890 via the Watershed. I was not unduly disappointed. This trip had always been a bonus. Maybe I had been over cautious and it would have been wonderful to have completed this section but it won’t be a huge walk to get back to the Watershed from Morvich sometime in the future. Two panorama photos taken at the summit show that I need to practise this a bit more on this camera but I hope they give a feel for the views. 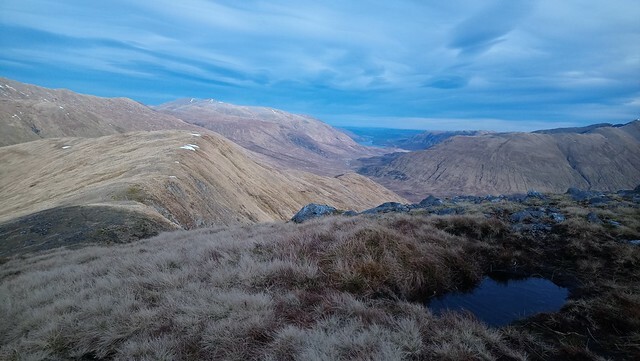 I found no difficulty in descending the ridge from Beinn Fhada to Gleann Gniomdaidh although the Watershed was confusing to follow down in the glen. 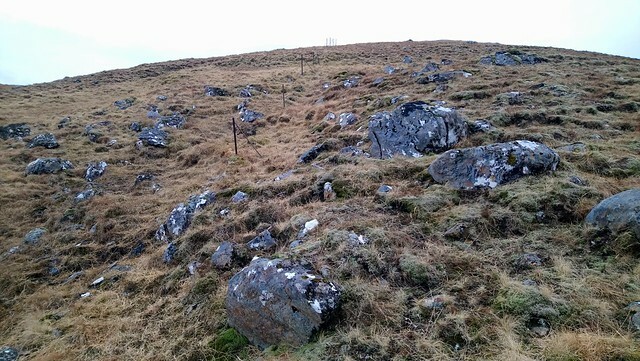 There was a handy line of fence posts that would take me onwards when I return. 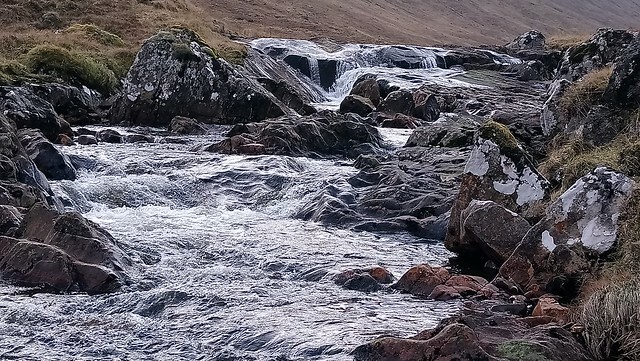 Having made my decision to leave it for now I didn’t rush back round to the bothy and even managed a splash in the Alt Gleann Gniomhaidh. I had looked for a deep enough pool to have a proper swim but having thought the spot I chose would do I found that it was full of big boulders that I bumped into at every turn. Still it was a pleasant, refreshing splash. Back at the bothy, I still had it to myself. Ciste Dubh looked like a good option for the next day’s walk out but I wouldn’t waste it if the cloud was low. 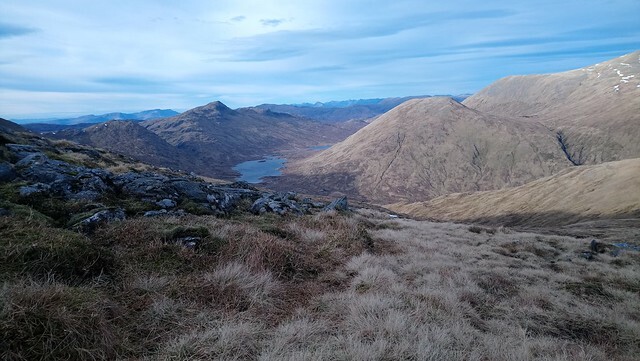 Reading more of the bothy book it struck me that walking to Morvich along the Affric Kintail Way would be a good alternative. I could then catch the bus to the Cluanie Inn and do some walking from there on Wednesday. I had a huge tea as I had rather a lot of food still in my pack (having forgotten half my lunch today!). It was pleasant sitting out in the warm afternoon sunshine with the odd feeling that there was something missing, normally associating midges with such conditions. Another leisurely start (I could get used to this) and the forecast was accurate. In fact, the cloud was even lower than forecast. I had never walked this path before and what a lovely path it was particularly down to the Edinburgh University MC hut at Glen Lichd House. Although the cloud was low the rain stayed off and it ended up being a day of 2 halves. 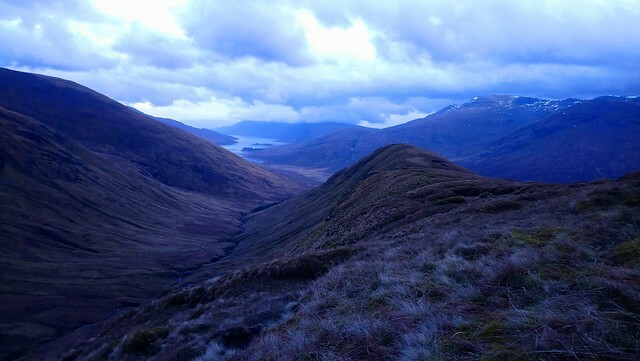 First half to Glen Lichd House was along a rocky path that twisted and turned through a narrow glen with a fast flowing mountain stream tumbling over waterfalls below and steep mountain slopes disappearing into the clouds above. Below Glen Lichd house the glen opened into a broad flat-bottomed valley full of sheep , the Alt becoming a wide, slow, meandering river. The path was a land-rover track and the mountains took a step back. The clouds started to lift and I started to look for a likely looking pool to swim in. I did not worry about polluting the river downstream, there were enough sheep around to ensure that anyone extracting water would be sure to sterilise it before use. The stones on the river bottom were full of colour and the water as clear as a bell. I had a more of a dip and less of a splash today. I am no Calum MacLean (Dhan Uisge, BBC Alba) but in my defence, he does use a wet suit. My pace also slowed, I had nothing to hurry for. By the time I reached Morvich the cloud had lifted off the tops and I began to wonder if I should have gone on to SnC and the Watershed but it is always easy to regret not doing something. The MWIS report for the next couple of days was for fine weather. I was generally enjoying my walk so what was lost, I could still walk, just not on the Watershed. I hadn’t seen anyone since the bus driver on Saturday but where I joined the path from Bein Fhada a walker followed me down to the car park at Morvich . We exchanged brief nods but nothing further. It occurred to me that I could probably blag a lift to the main road but it was only a mile away and I had designs on having a meal and a beer at the Kintail Lodge if it was open. Checking the website, it mentioned that it was undergoing major refurbishment but the bar was “open as usual. Once I reached the main road I turned onto the old road that goes along the edge of Loch Duich for the ½ mile to the hotel. Here I encountered some of the many feral goats that inhabit these parts and then a view of an otter that initially swam full tilt towards the shore but then about turned and headed back out into the loch. The tide was out and I was some 100 yards away amongst the trees but I wonder if it had got wind of my scent. Disappointingly the hotel was closed. “Open as usual” winter hours meant that I would have to wait Thursday, not 5 p.m. I had thought I would catch the 19.00 bus up to the Cluanie Inn but with the hotel closed the thought of hanging around as the sun went down did not appeal. I looked at other options. The first bus at 10.30 in the morning would be too late for me to contemplate doing the east end of the S Cluanie ridge but I could walk up and camp in Glen Undalain, I would then climb Biod an Fhithich via A' Mhuing. I headed on and as I walked through Shiel Bridge (petrol station shop also closed, if it had been open I could have stocked up and gone back to the 'Shed) just before 5 pm a citylink bus went past. I hadn’t checked the Skye-Fort Willaim times so had overlooked this bus but had I known it existed I would have used it to get me up to Cluanie. Ah well, as I discovered the next day Biod an Fhithich was a wee gem and well worth the route I took. My campsite was less than ideal and I should have crossed the foot bridge over the Alt Undalain and camped on a flat grassy patch by the river just a bit further on. Another day without having to hurry. I followed a dry stane dyke up onto the ridge which was broad and mainly grassy. I went over every rise in the hopes of catching a safe scramble but apart from the very end there wasn’t much on offer. I was therefore surprised to see very definite paths off around the outcrops that were easy enough to cross. I investigated one and thought it was more suited to mountain goats than anyone looking to avoid a climb. I was also puzzled by the hoof prints on the path. They were very definitely heading upwards and seemed smaller than what was produced by the average deer of which all I had seen was a very dead hind near the start of my walk. Note the "doglike" shadow to the right. I don't know what caused that, a stunted tree perhaps. The views were good but limited by the haze and even if Skye hadn’t had been blocked by Sgurr Mhic Barraich, I doubt if I could have seen it. 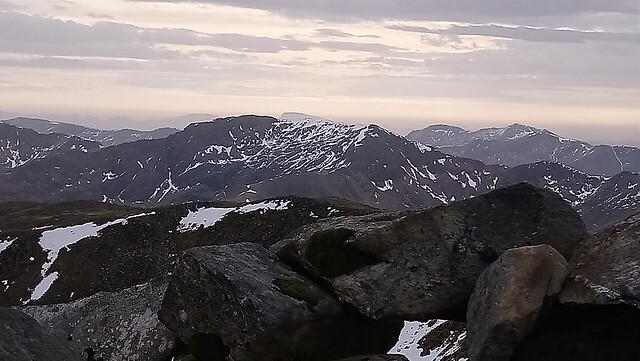 The sun was directly ahead and the Forcan Ridge was visible only in outline but the Five Sisters were close by and clear. I was able to confirm the time of my bus for the next day as I could see today’s bus heading up the A87 at the appropriate time. Mostly the noise from the road didn’t impinge. It may be different on a summer weekend, only 2 motorbikes roared by today. Half-way up the ridge, I couldn’t believe my luck when yet again an eagle flew off from the ridge. It was nearer than the one I saw the first day but much further than the one I saw the 2nd day. I reflected that I had been fortunate to have seen eagles on 3 days and an otter on the other day I walked. I had plenty of time so I took lots of photos. 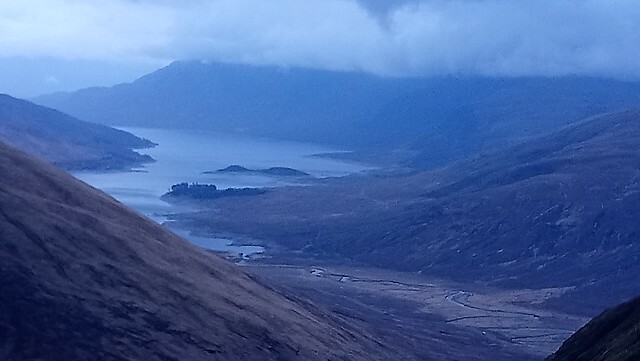 I stopped constantly to look back to Loch Duich, taking photos from every rise in the ridge. Then just before the final knobble of the summit the separate mysteries of the hoof-marks and risky escape routes came together as I spied 3-4 goats DUH! They melted away as I pulled out my phone. The other side of Biod an Fhithich is a different character, a gentle descent to the bealach and I decided against continuing up the Forcan ridge and wandered back down the stalkers path to my campsite. I did think about walking on down to catch the bus back down the glen but this would get me back far too early. I might also run into the bus driver from Saturday and have to explain why I was only a few miles from where he had dropped me on Saturday. Spring was in the air with my first sighting of frogs this year. I have kissed many princes that have turned into frogs so I wasn’t going to risk turning any back. On the way I found the best dipping spot of my whole trip. I got thoroughly wet and felt sparkling clean, ready for my 7-8 hour bus trip home the next day. The river was broad at the crossing point but with plenty of rocks, not a problem. I am not sure how it would be in spate. Climbing Biod an Fhithich was a fine end to a very different but nonetheless enjoyable trip than I had planned. I have not put in distance or height gained as on my last outing to the Watershed, I realised that the pressure of saying how far I had gone and how long it had taken was detracting from the enjoyment of my walk. Each of my walks in this trip can easily be done in a day, with time to spare! As for me, I have gone as far as I have gone and Iwill take as long as it takes me. 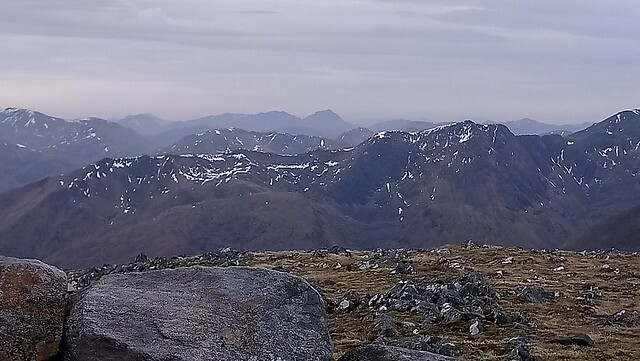 Next day I headed for home, I had contemplated was restocking my food in Kyle of Lochalsh but with normal February/March weather apparently resuming at the weekend I didn;t contemplate it for long . At the bus stop I met a Welshman returning home. He was going to get home to South Wales before I got home to Aberdeenshire! 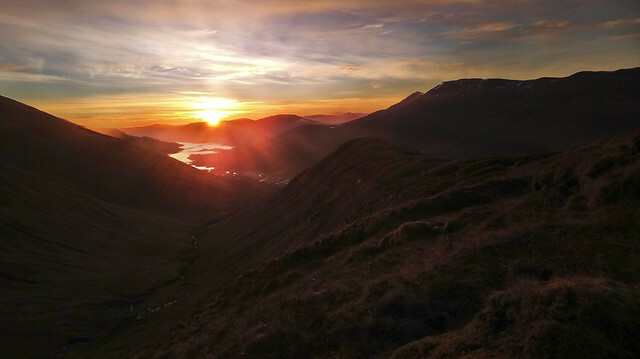 Scotland's Watershed Part 10, Great Glen to Knoydart.